From the vault!! I’ve been sitting on this post for a while. I wasn’t sure if I wanted to publish it or not. It even has my old watermark! 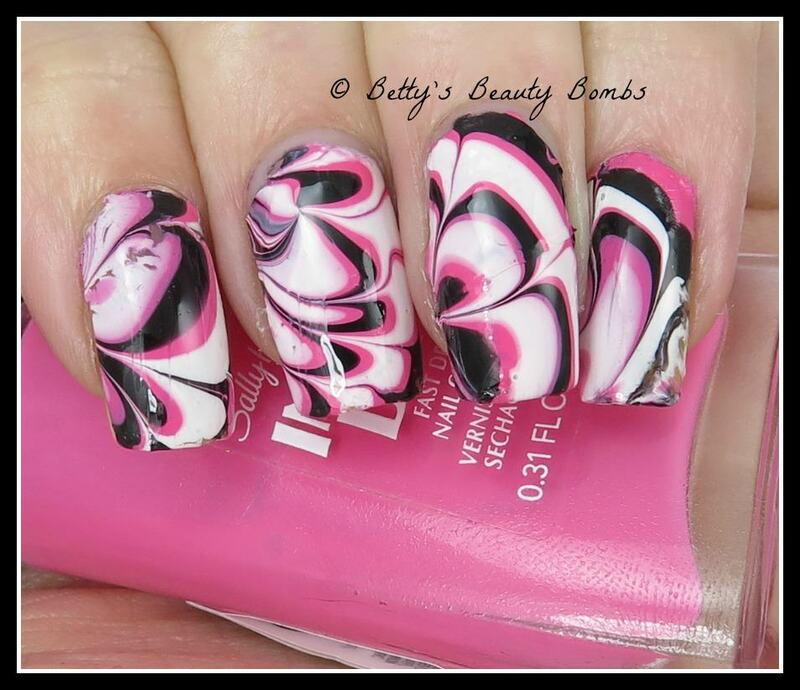 It’s high time I did another watermarble! 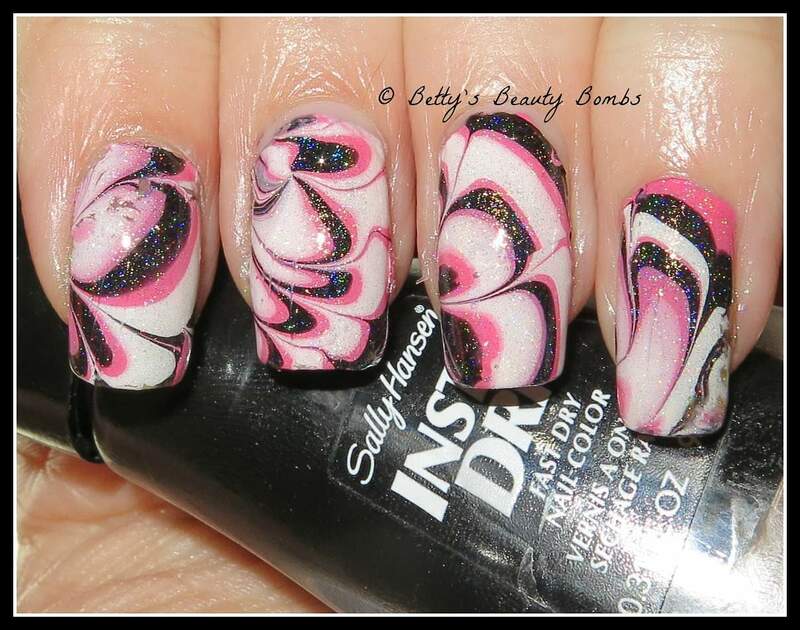 This one uses Sally Hansen Sumac Sonic, Sally Hansen Night Fright, and Sally Hansen OMGhost. Once again, I used my decals technique to make this mani. On my pointer finger, you can see a few bald spots close to the cuticle line. This happened when I was trimming the decal. I thought I’d cut it all the way off but I hadn’t. So, when I pulled the excess to discard it, it pulled on the polish that I wanted to keep! I repaired it as best as I could. It’s not very noticeable in real life, but the gosh darn camera doesn’t miss any errors!! It’s really too bad because my pointer finger decal was my favorite one. Isn’t that always the case?? I had a hankering for an actual holo mani but holo polishes aren’t usually opaque enough to watermarble. So, I used Enchanted Polish Djinn in a Bottle to top this off, giving all three colors a bit of a holo spin. Djinn doesn’t show up very well on the white (so if you need a white holo, keep looking!) but it gives the black a really nice rainbow look. A few months ago, there was a lot of e-chatter about Loki’s Nail Vinyls so I thought I would pick up some of my own! I ordered a variety pack as well as a few selected designs (like the TARDIS, obviously). 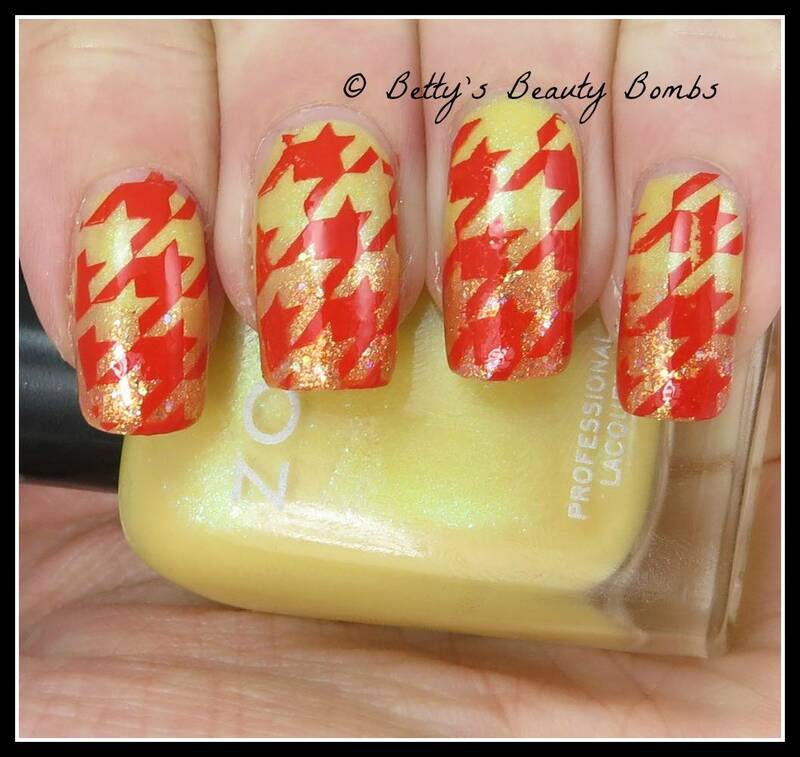 Today’s mani uses starburst decals from the variety pack. I am highly impressed with Loki’s customer service. My first package actually got lost on its adventure from Australia to the US. It either fell off a plane or out of a boat! :P When I let Loki know that the package was MIA, she was super nice about it and sent me a replacement package post haste. (Pun intended.) I was so happy she did! I got the second package safe and sound. And the vinyls have been sitting in my nail art supplies drawer now for way too long! I finally busted them out and I’m super pleased with them. I posted on Facebook a while back asking if anyone knew about any super sticky stencils. I have such curved nails that if it’s not sticky enough or the vinyl is too thick, it won’t lay flat on my nails. These decals were a dream. They suctioned themselves to my nails and I got clean, crisp lines. Hooray! I started with two coats of China Glaze Grape Juice which is a gorgeous dark purple shimmer. I nabbed this one out of a basket at Sally Beauty. It called to me from across the store. Then, I used the vinyls (Which has both the regular design and the inverse) and stuck it to my nail. 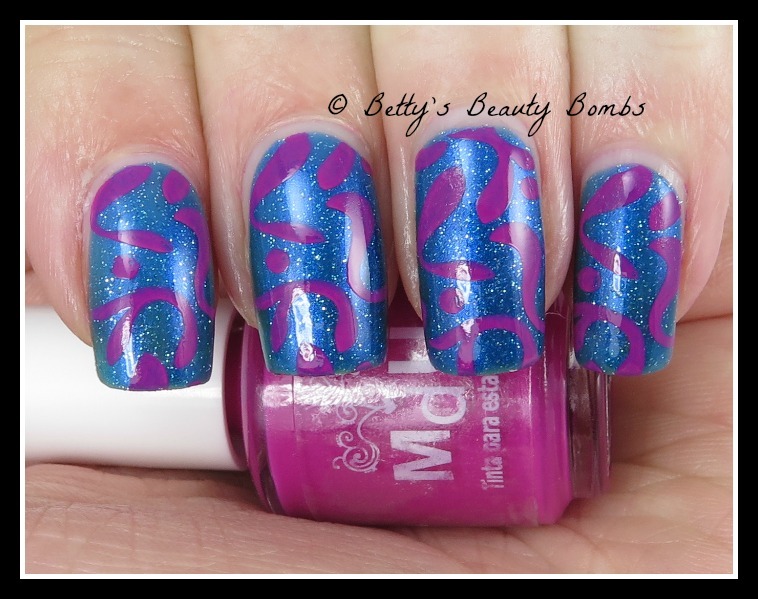 Then, I generously applied Nabi Flamingo which is a hot pink holo. I have no idea where to get Nabi polishes and Google is no help. I picked this guy up at a polish-lovers meet up in my area. Today’s mani starts with two coats of OPI Purple with a Purpose. 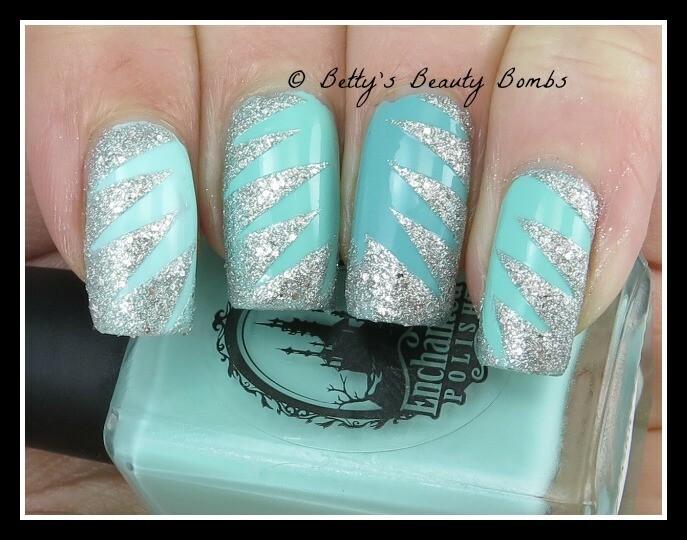 I used stencils from Vinyl Boutique that are a large chevron to tape off my tips. 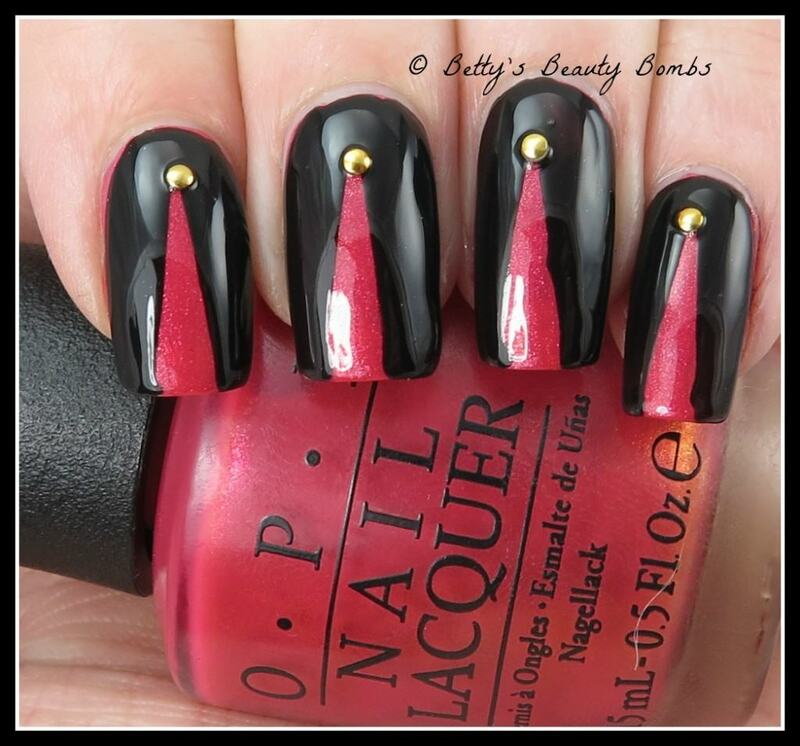 Then, I used OPI Vampsterdam on the tips. Finally, I used OPI Push and Shove to dot chrome accent dots down the middle and along the ‘v’. You can get dotting tools wicked cheap on Amazon. They take a while to arrive because they ship from China, but it’s way cheaper than buying the tools in a retail store. OPI Vampsterdam is a dark purple. I’m going to have to use this guy as a base color for some nail art because it’s so darn pretty that I want to see it on a full mani! 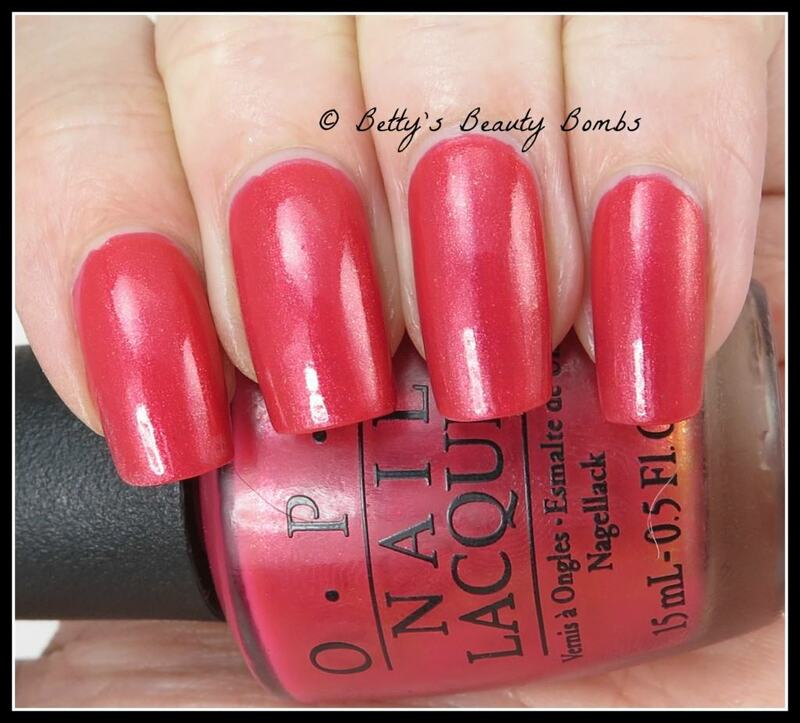 OPI Push and Shove has been one of my favorite chrome polishes since I first got it at Sally Beauty. It’s the most mirror-like chrome polish I’ve ever seen! I even have a back up bottle of it…..just in case something terrible happens. I picked up OPI Purple with a Purpose at CosmoProf when my mother-in-law got me in with her top-secret handshake. We were just walking down the OPI aisle when she points to this one and said, “that’s one of my favorites.” Since she’d been a nail tech for 20+++ years, I grabbed it without even a second thought! I’m glad I did! This purple is gorgeous! It’s a metallicy shimmery purple with blue undertones. 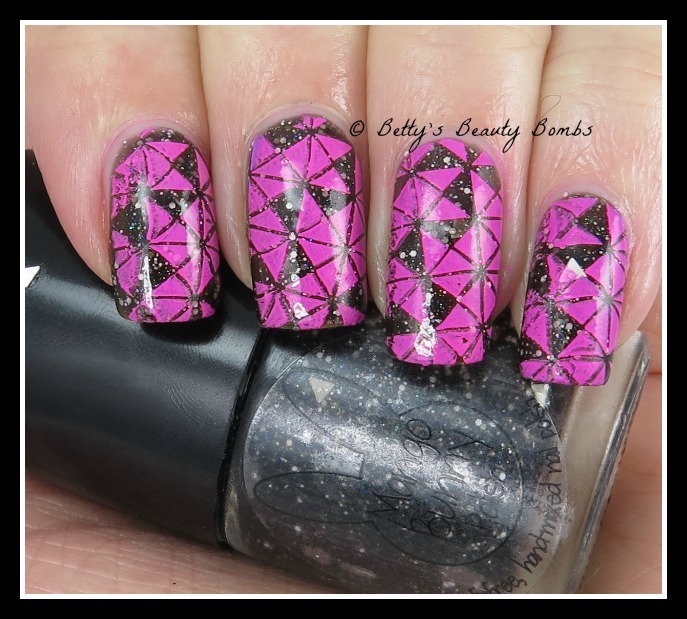 Triangle Nail Art using OPI Go with the Lava Flow and Who Are You Calling Bossy? Let’s mix it up today! Here’s a nail art style I haven’t done in a while!!! I started with two coats of OPI Go with the Lava Flow which is from their new Hawaii collection. 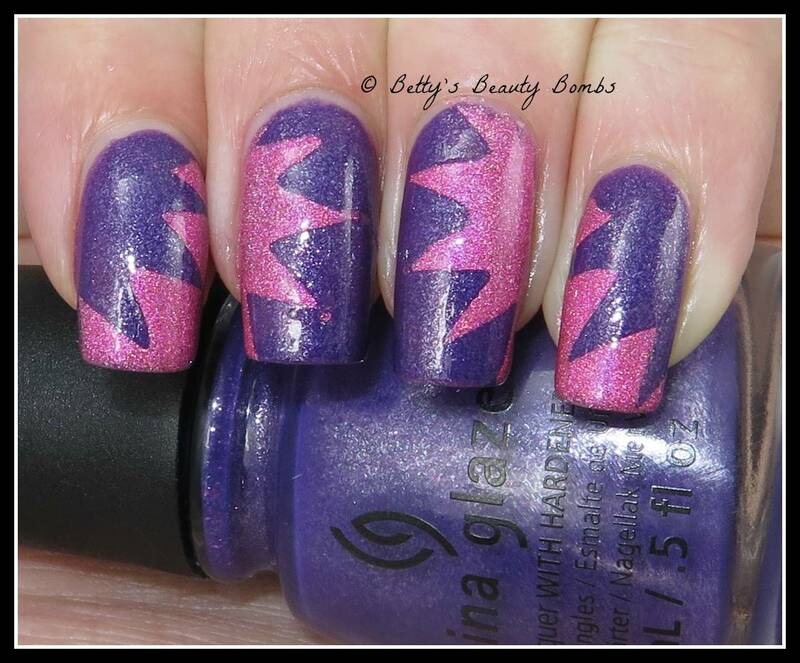 I used triangle vinyls from Vinyl Boutique and OPI Who Are You Calling Bossy??? Finally, I used these tiny little circle rhinestones which I got in my January GlitterDaze Daze of the Month Subscription. Who are you Calling Bossy??? is a pretty standard black cream. I picked it up because I was at CosmoProf with my mother-in-law, I love OPI, and I don’t have a plain black creme from them. That sounds like three pretty darn good reasons to buy a nail polish, am I right? 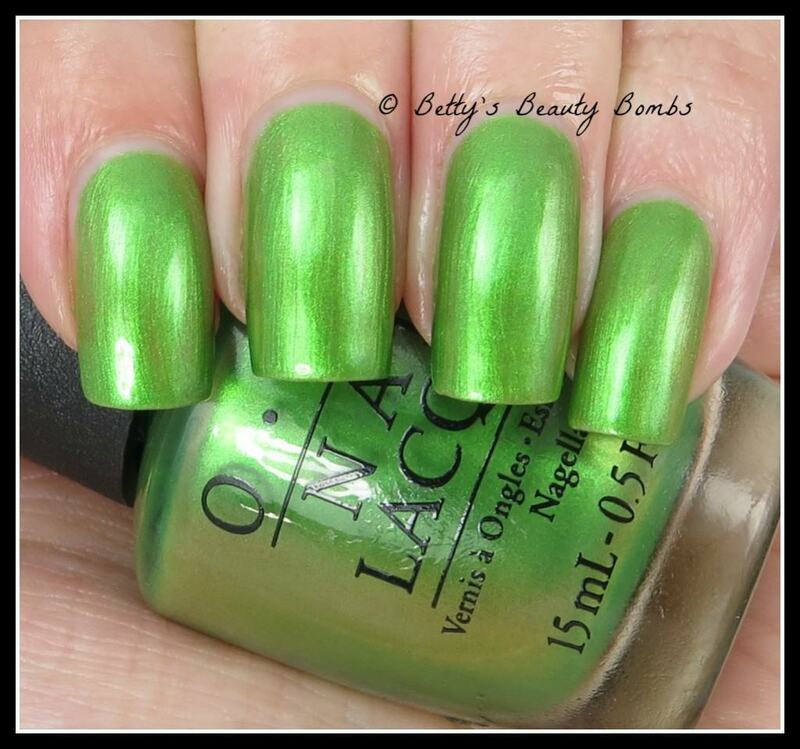 Author AnnePosted on March 25, 2015 December 22, 2016 Categories ArtTags Art, OPI, Vinyl BoutiqueLeave a comment on Triangle Nail Art using OPI Go with the Lava Flow and Who Are You Calling Bossy? I decided to take a little break from stamping and I did a french tips mani using scotch tape as my guide. I used KB Shimmer Young Thing and Nicole by OPI Pretty in Plum. 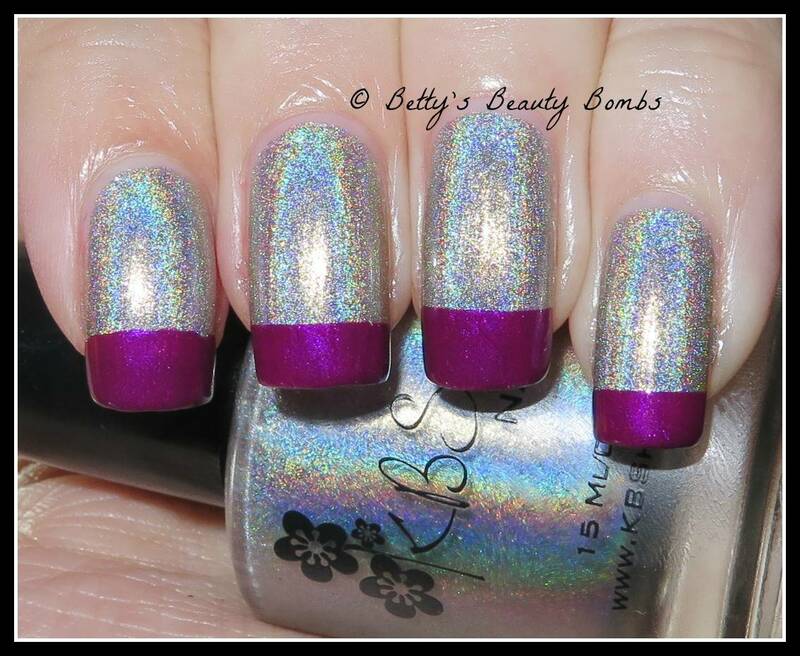 KB Shimmer Young Thing is a strong linear holo. This is beautiful and I’m really glad I stumbled upon this one! Today’s mani starts with two coats of OPI Red Lights Ahead…Where? and I used a design from Cici&Sisi Yellow collection and Mundo de Unas Lavender to create this look. 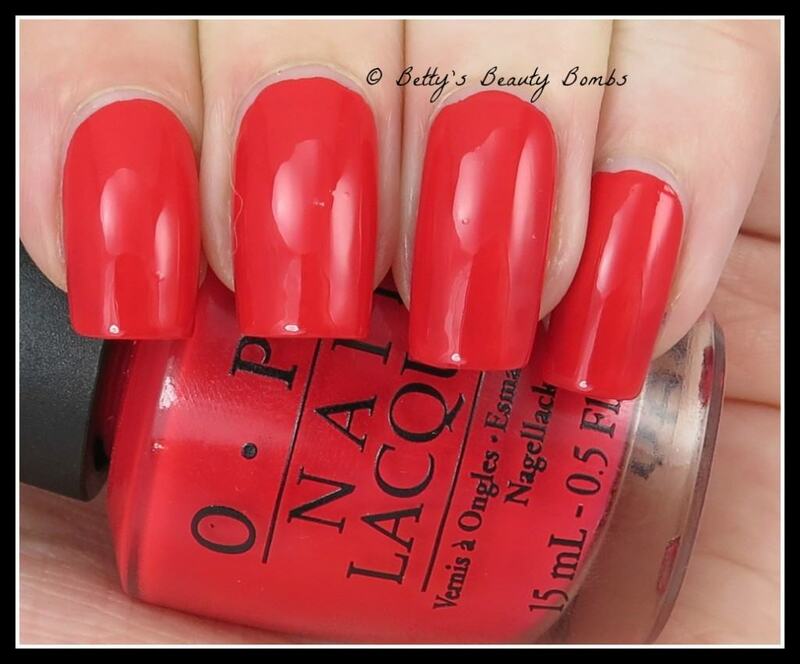 Here is a plain swatch of OPI Red Lights Ahead…Where? It is a very creamy red with orange undertones. I think this one is super flattering and I’m really happy I have it! Today’s mani starts with Pure Ice Blue Hue over white. 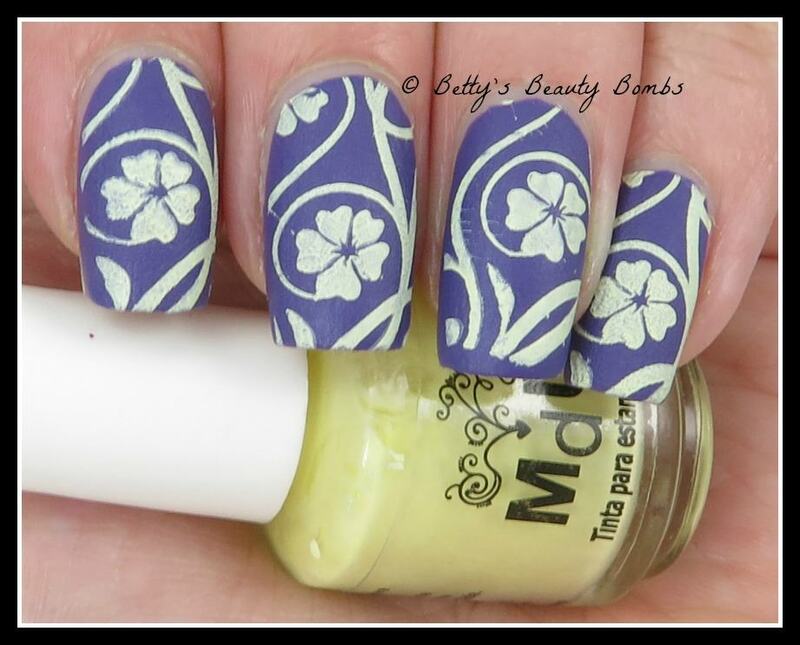 Once dry, I used Mundo de Unas Blue Navy and a design from Cici&Sisi Yellow Collection to create the two-toned blue stamping look. Today’s mani starts with two coats of Pure Ice Dollface and then two coats of Pure Ice Poppin Bottles, both of which were sent to me as samples from Pure Ice. 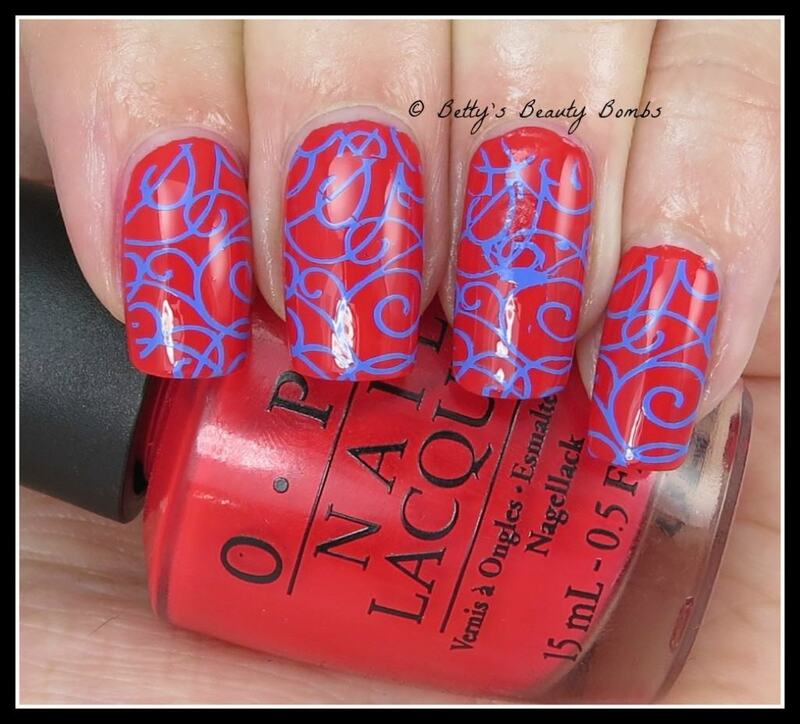 For the stamping polish I used Mundo de Unas Red Wine and the design is from Cici&Sisi Plate 21 from the red set. 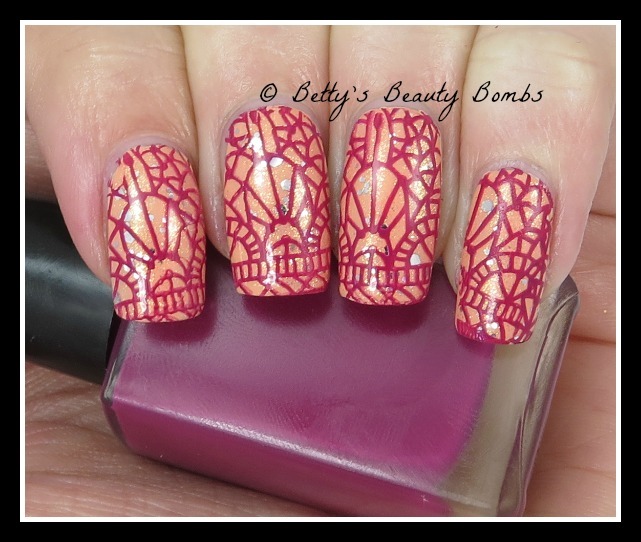 This stamping design would also be great for a leadlighting mani since it looks just like a stained glass window. Today’s mani starts with two coats of Love, Angeline Emeralds are a Girl’s Best Friend. I stamped using Mundo de Unas Papyrus and a design from Pueen Plate 86. Emeralds was in the February 2015 Beauty Quartet box. I’m not a big fan of this look and I ended up taking it off right away. I’m not totally sure why I don’t like it. Perhaps just the wrong color combo for the design? 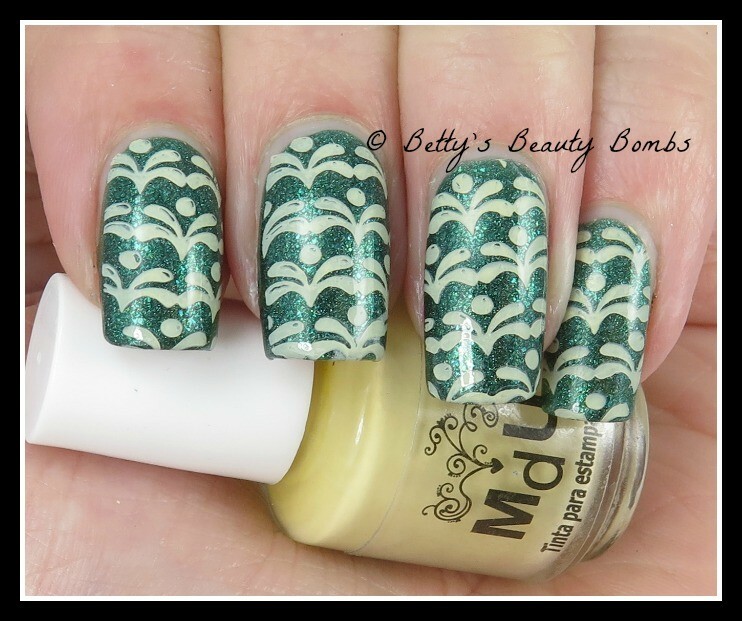 One of my favorite stamping combinations is a two-tone one. 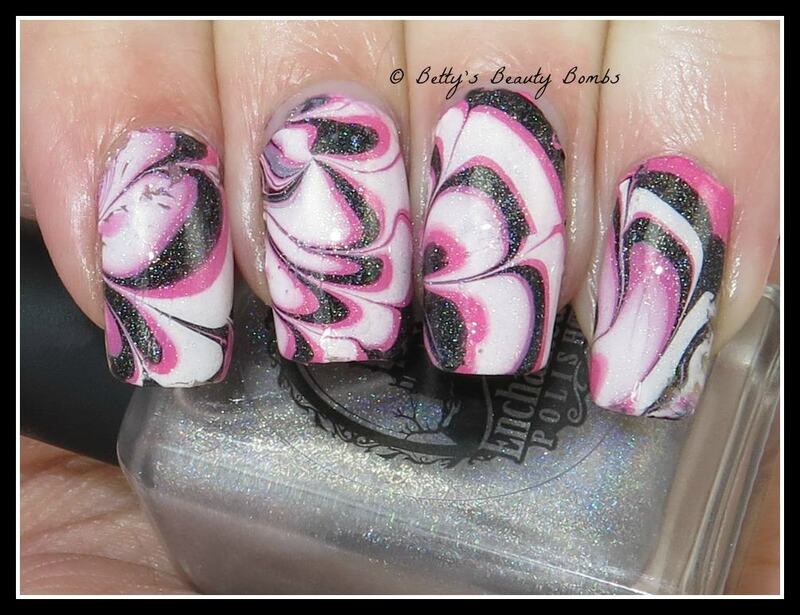 This is also one of my husband’s favorite manicure’s I’ve done. That cracks me up because sometimes I feel like two-tone stamping is my easy way out of having to think too hard. :P To really make a two-tone mani pop, mix different shades of the same color, but also different finishes. I like this look because the cream jumps off the metallic background and has a nice contrast. I only send one email per day and I never share your email with anyone, ever. Today’s mani is two coats of Sally Hansen Velour which is from their Velvet Texture Collection. Then, I used Mundo de Unas Cream and a design from Cici&Sisi’s Yellow Collection to create this look. 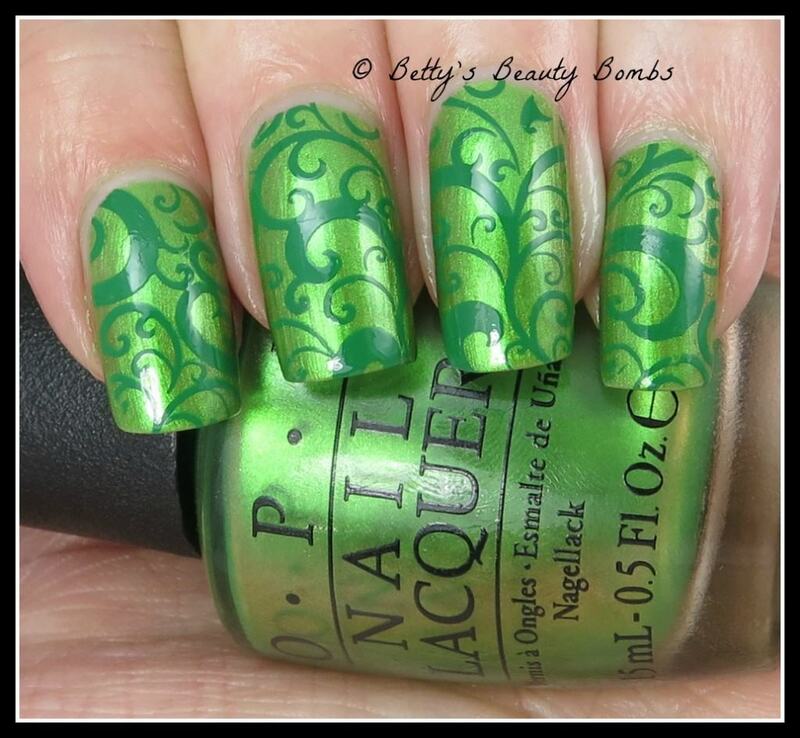 There’s something pleasantly spring-like about this mani. I know spring isn’t for another few weeks, but isn’t it kind of nice to think about? Sitting outside, reading a book, petting my dogs, and looking at holo polish in the sun! Here is a plain swatch of Sally Hansen Velour. I’m a huge fan of this collection! I really love the textured look that Sally Hansen came up with! If you liked what you saw today, don’t forget to subscribe! I only send one email per day at 9am and your email is never shared with anyone, ever. Today’s nail art starts with two coats of Pure Ice Rosy Glow (originally sent to me as a press sample) over white. Then, I used a matte topcoat. 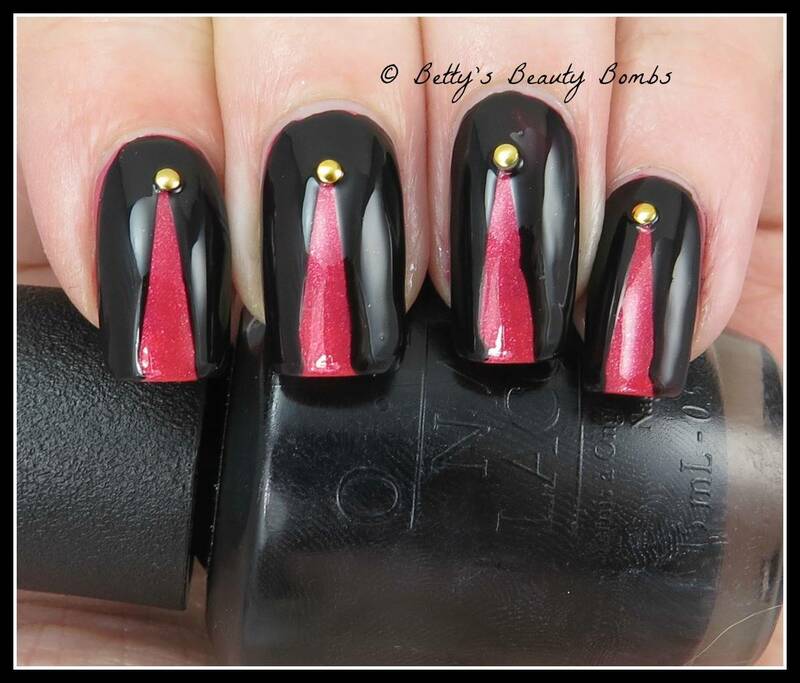 The stamping polish is Konad Black and the design is from Cici&Sisi Plate 21 from the red set. Zoya sent me Zoya Eden which I swatched for you here. 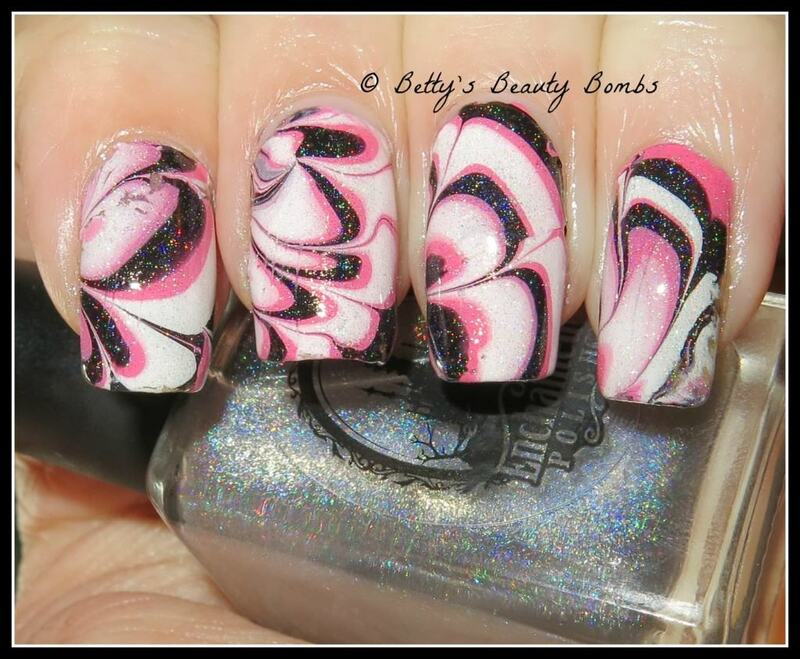 It wasn’t on purpose, but I think this nail art ended up looking like a bit of a watermarble! 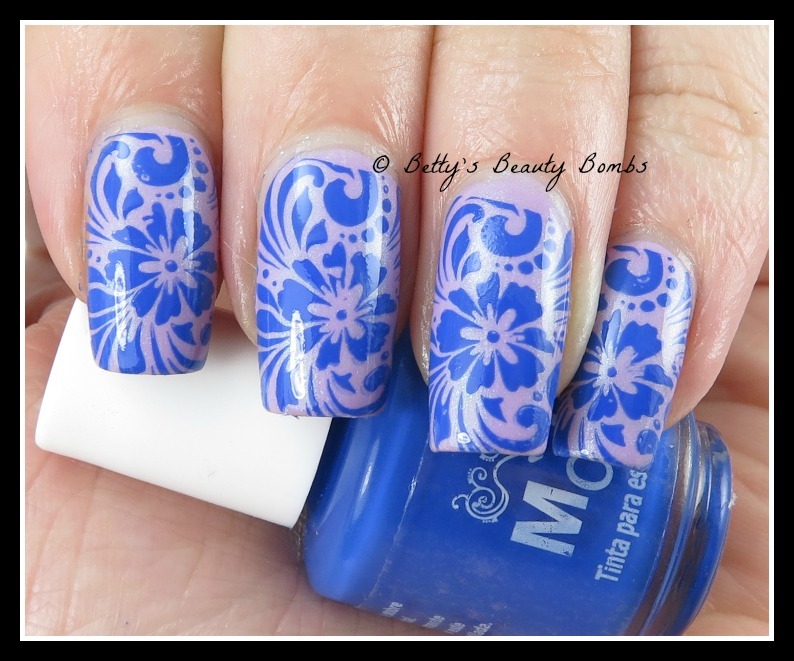 The stamping polish is Mundo de Unas Pastel Blue and the stamping plate is Born Pretty Store Plate BP-L-005 You can see all their available image plates here: BornPrettyStore Stamping Image Plates. As I mentioned earlier this week, I’m reading Nail Structure and Product Chemistry by Doug Schoon. Today, I learned that in general, men’s nails grow faster than women’s! That sounds a little backwards to me! LOL! And not fair at all!! The stamping didn’t turn out quite as crisp as I would have liked, but the effect of a fake watermarble looks pretty cool! Today’s mani starts with two coats of Philly Loves Lacquer The Best Day of the Year which is from the February 2015 Beauty Quartet box. 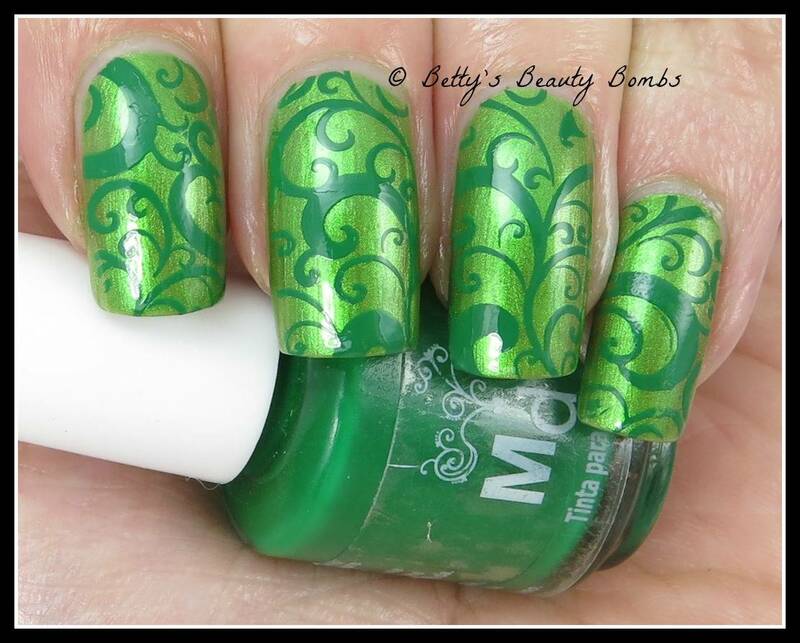 The stamping polish is Mundo de Unas High Green and the design is from Pueen Plate 86. I’m starting to read Doug Schoon’s book Nail Structure and Product Chemistry. It’s meant for nail technicians, which I am not, but I do have a thirst for knowledge! It will also help me answer more nail-related questions which I’m excited for. Did you know that your nails grow at different rates? As a general rule of thumb (hahahaha), the longer the finger, the faster the nail grows! This isn’t true 100% of the time because there are other factors, but I certainly thought it was an interesting tidbit! I love how crisp this green is! I must admit, I’m pretty impressed…Almost worth the smell that MDU polishes are known for! I’m stepping outside my comfort-zone with today’s mani! I rarely wear yellow! :P This is two coats of Zoya Daisy which is from the Spring 2015 Delight collection (originally sent to me as a press sample). 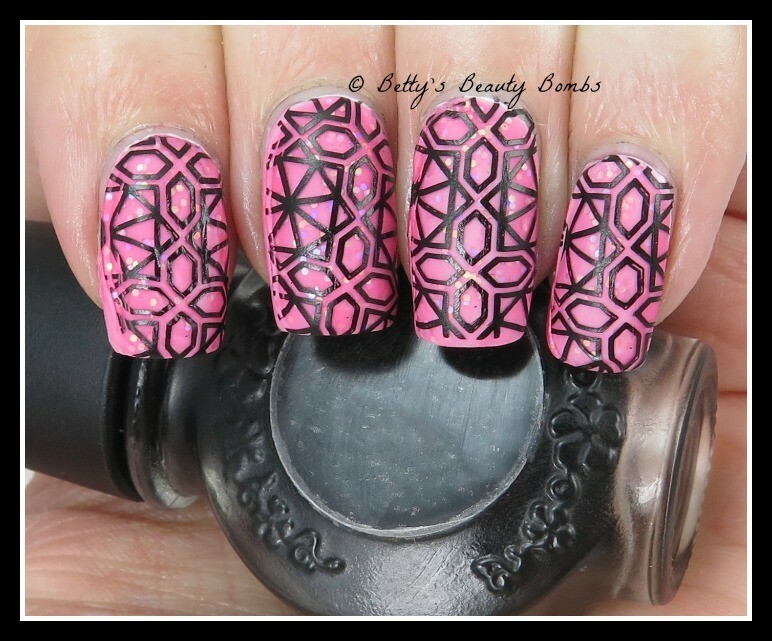 I purchased a ton of Mundo de Unas stamping polishes so I grabbed the MDU Neon Pink to pair with it. 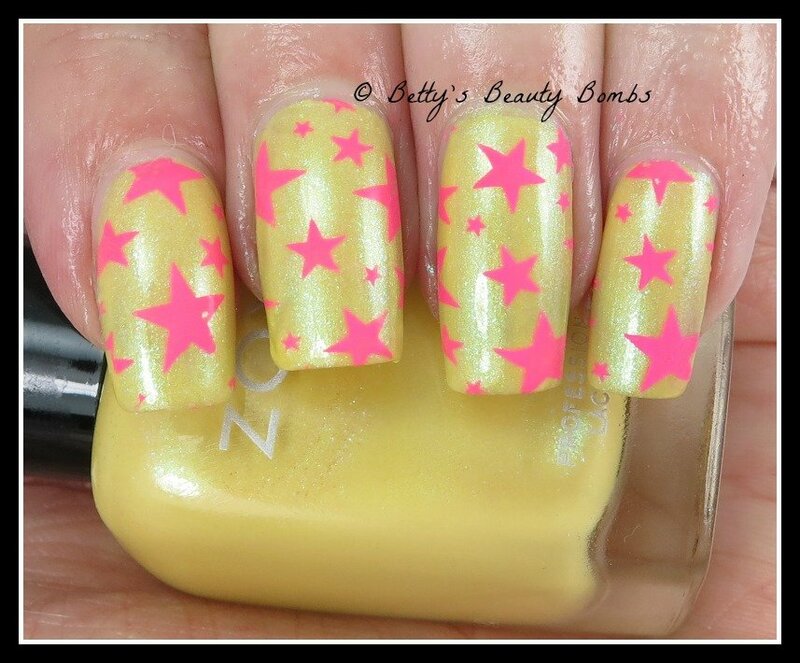 I was sent Born Pretty Store Plate BP-L-006 to review so I used the stars design from that plate for this look. You can see all their available image plates here: BornPrettyStore Stamping Image Plates. My husband pointed out, and I agree, that this looks quite 80’s! Like something Gem would wear. I only vaguely remember Gem, but I know she’d rock this mani! 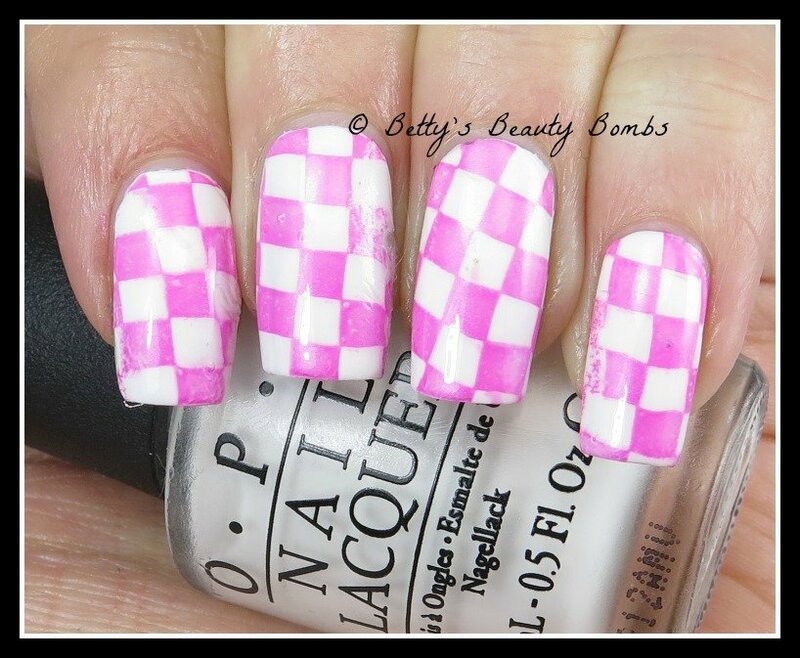 Today’s mani is another one for the Crumpet’s 52-week pick and mix challenge! I combined both prompts this week because I’m crazy like that. The prompts are Houndstooth and Orange/Red/Yellow. 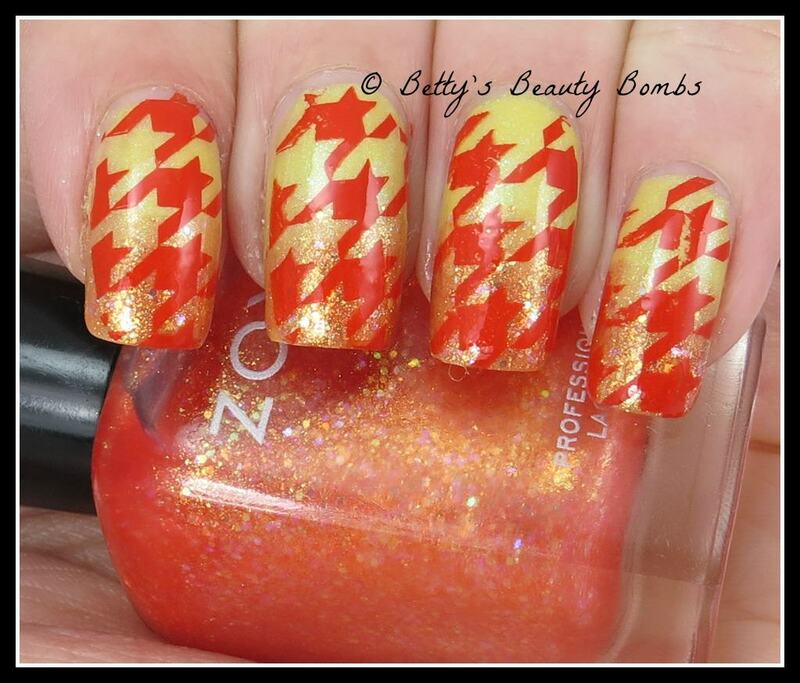 I used Zoya Jesy from the Bubbly Collection, Zoya Daisy from the Delight Collection, and Mundo de Unas Reddish. 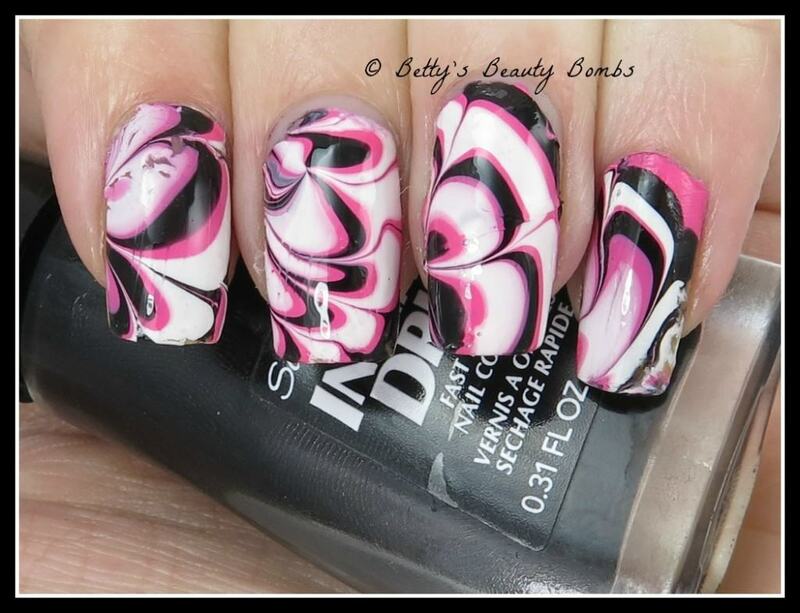 The design is from Born Pretty Store Plate BP-L-006. The Zoya polishes and the stamping plate were originally sent to me as press samples by the respective companies. 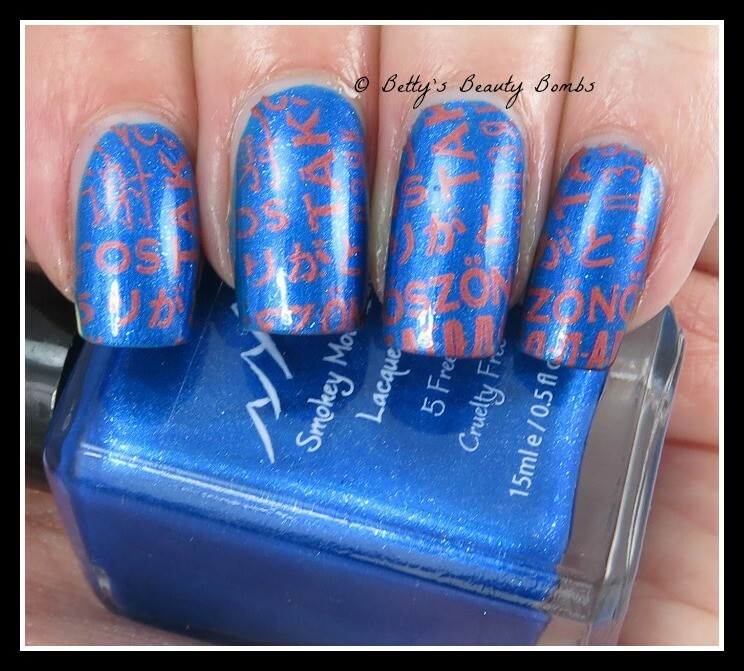 To avoid having to do any cleanup with stamping, I used Bliss Kiss Simply Peel liquid latex. You can read my full review of that here. My husband said this mani looks like ships from Asteroids flying over candy corn. What an imagination that man has! 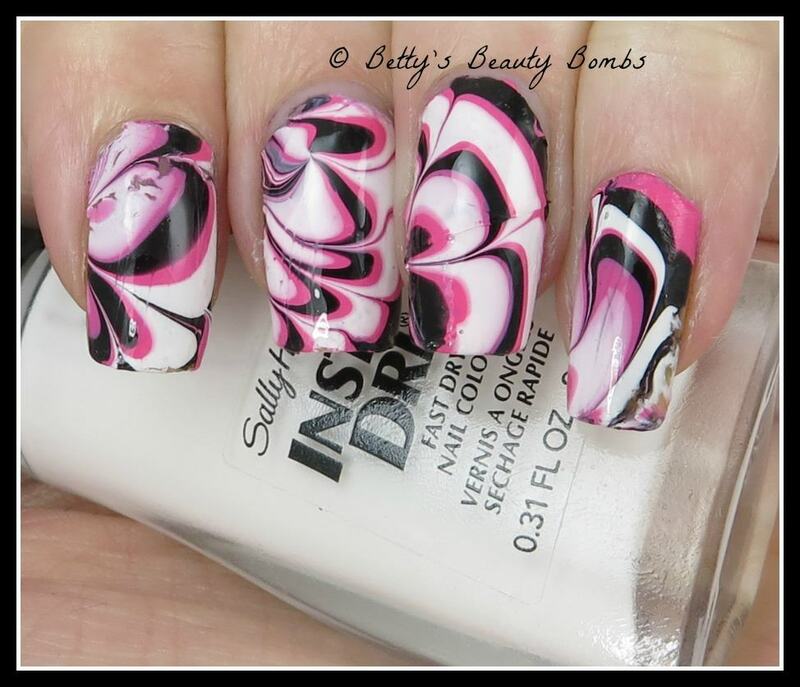 Check out these other talented ladies and their nail art for this week’s prompts! For today’s mani, I started with two coats of Smokey Mountain Lacquer Pleasure in Your Base which is from the February 2015 Beauty Quartet Box. 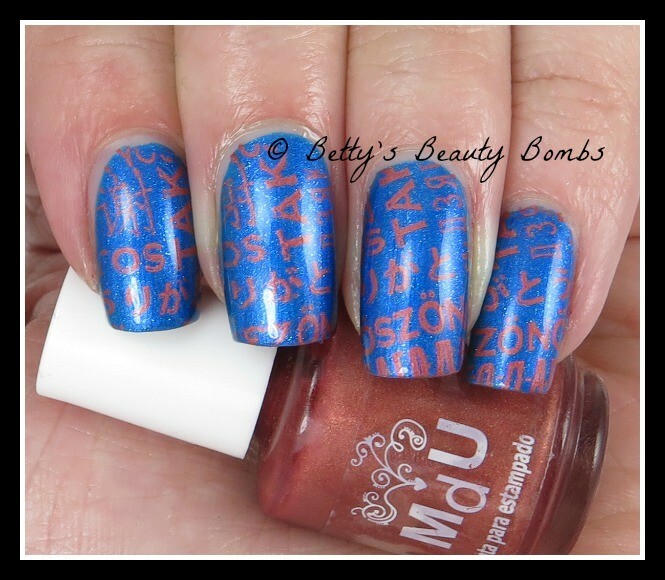 The stamping polish is Mundo de Unas Copper and the foreign words are from Pueen Plate 86. There are a number of different languages on this plate–but I’m naive and can’t identify them! How embarrassing is that? I’m pretty sure there is french and Russian or German. No full words are showing, though. The night before I did this mani, I trimmed my nails down quite a bit. Too much, I think. I miss my longer nails! I still have quite a bit of free edge here, but not what I’m used to. I guess the plus side is that it’s easier to type now? When I discovered that Dollish Polish had a polish called It’s Bigger on the Inside, I had to buy it, of course! 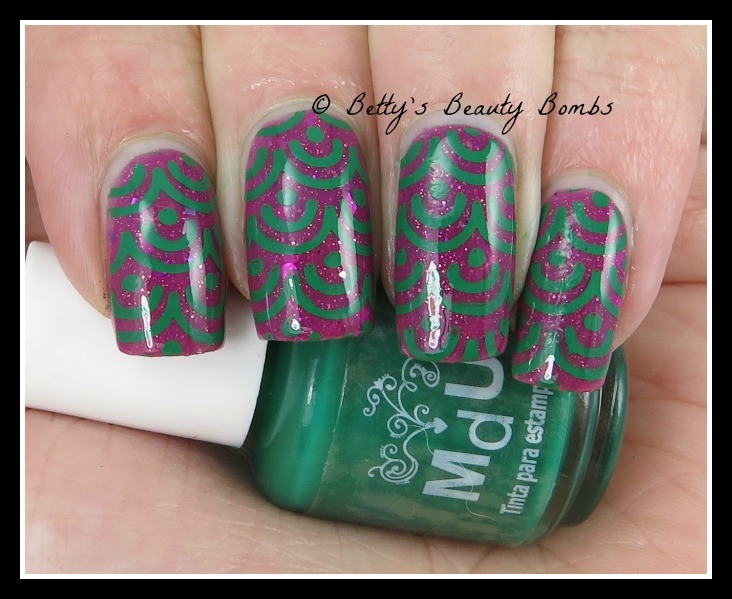 This mani is two coats of It’s Bigger and then I used Mundo de Unas Fuchsia and a design from Pueen Plate 84. Here is a plain swatch of Dollish Polish It’s Bigger on the Inside. 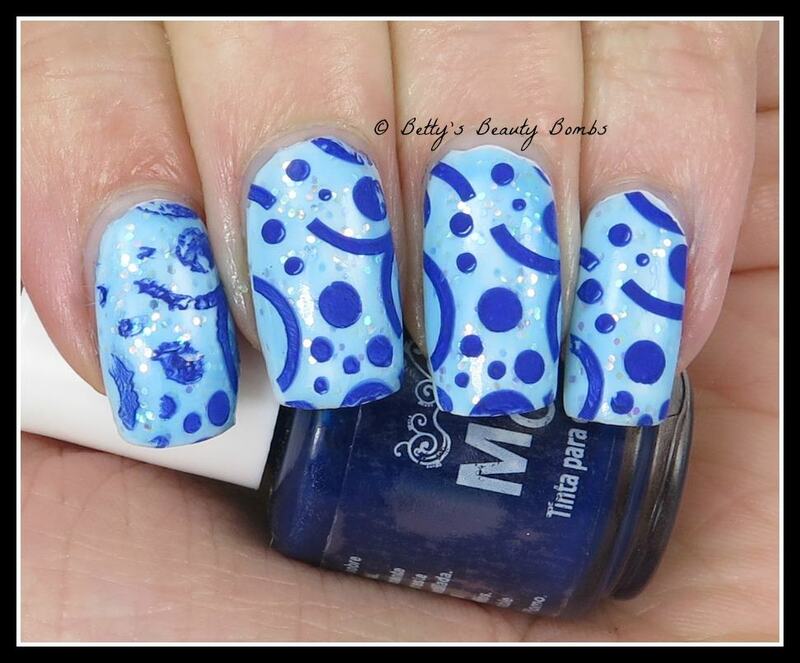 It looks just like a starry night sky which is totally perfect for a polish inspired by the TARDIS!! I’m rewatching all the revamp episodes of Doctor Who now. Matt Smith drives me bonkers. I pine for David Tennant! At least I like Peter Capaldi as the Doctor. He’s quite a bit more sophisticated than Smith. I recently did a comparison post for some mint polishes (here). Since I was short on time that night, I decided to do artwork right on top of the comparison mani, even though the mint colors didn’t exactly match! In the end, I actually really liked the effect of different mint shades!!! I used Enchanted Polish Sweet Mint, China Glaze For Audrey, and China Glaze At Vase Value. (For a rundown on which is which, see the comparison post.) 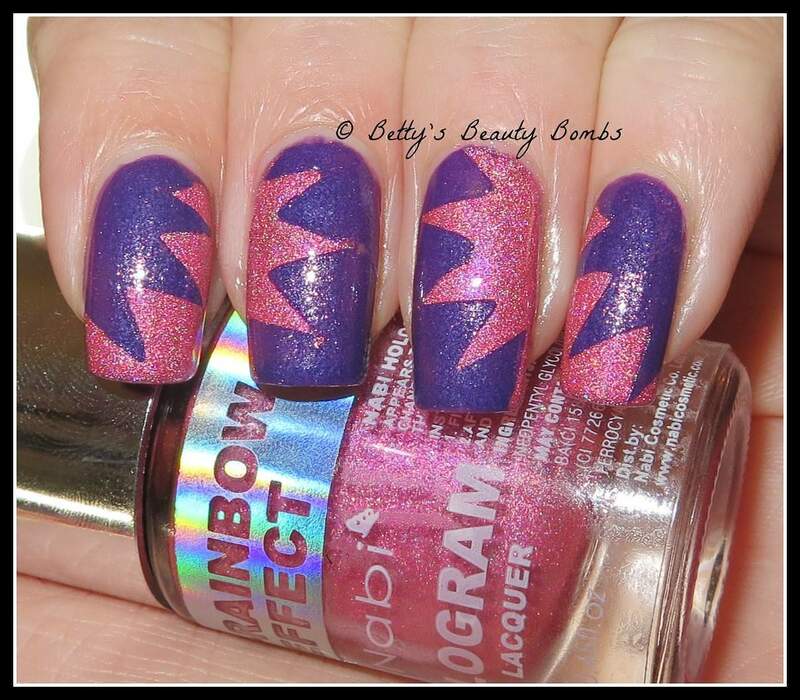 Then, I used some triangle decals I purchased from Vinyl Boutique. I had to use multiple triangle vinyls on each nail to get this star nail art effect. The silver polish is OPI It’s Frosty Outside which is a gorgeous silver texture polish. I’m pretty excited for this weekend. I have NO plans. My calendar is completely blank! Wahoo!! I’m going to stop by Sally Beauty tomorrow and take advantage of their BOGO sale on FingerPaints and I also have a 30% off coupon. I already warned my husband that I’ll be coming home with loooooooots of polish from Sally’s….but that it won’t cost a lot of money! I’m pretty excited. I’ve been looking forward to it all week! Then, I’ll probably spend a good chunk of Saturday and Sunday swatching those polishes and getting a nice backup of posts. I like to be a few weeks ahead on my posts just in case life happens. I want to make sure you have something to read, right?! 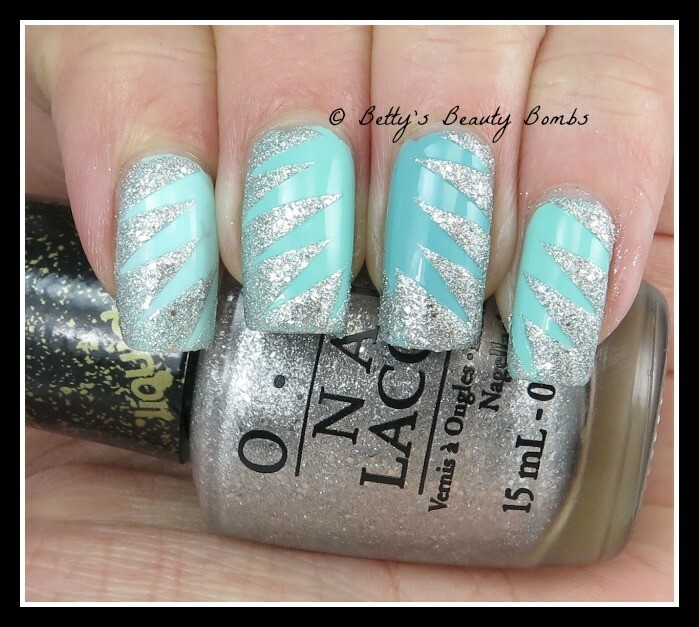 Author AnnePosted on February 20, 2015 December 22, 2016 Categories Art, China GlazeTags Art, China Glaze, Enchanted Polish, OPI, Vinyl Boutique1 Comment on Silver and Mint Stars! I’m going to test out a new type of post – showing you one polish, multiple different ways. Please let me know what you think in the comments! Today’s guinea pig is Dollish Polish Seduce Me. I got Seduce Me in the limited edition Dollish Polish Valentine’s Day Box. First, we have Seduce Me with a glossy topcoat. This is how the polish is ‘meant’ to be worn. It’s a lovely hot pink crelly with pink and blue shimmers. This quickly became one of my favorite pinks in my collection. Then, I put a matte topcoat on this girl and she took on a whole new life! I can’t decide if I like it better glossy or matte because I seriously love it both ways! 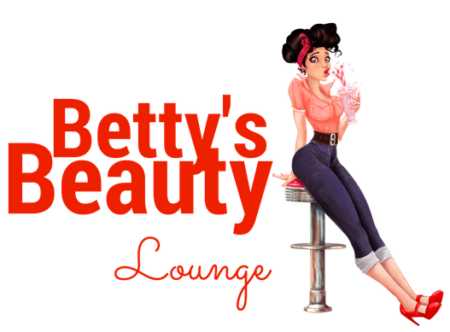 Lastly, Here is Seduce Me as a base for some nail art! 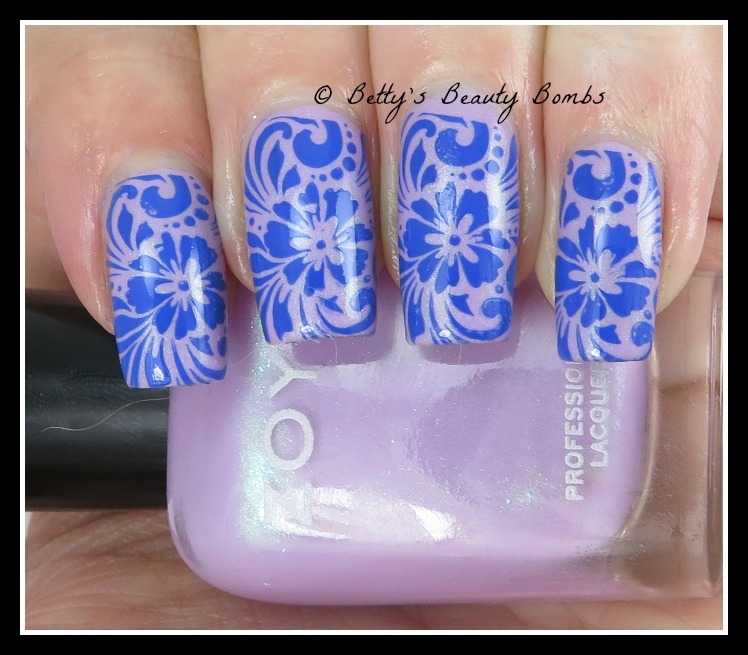 This stamping polish was Mundo de Unas Lilac and the design is from Pueen Plate 82. What did you think of this post? Did you like seeing a single polish a variety of different ways? If you liked it, please let me know in the comments and I’ll do more like this! I was sent Born Pretty Store Plate BP-L-006 to show you some of the designs and to review for you! I picked this plate because I was drawn to the beautiful flower designs. 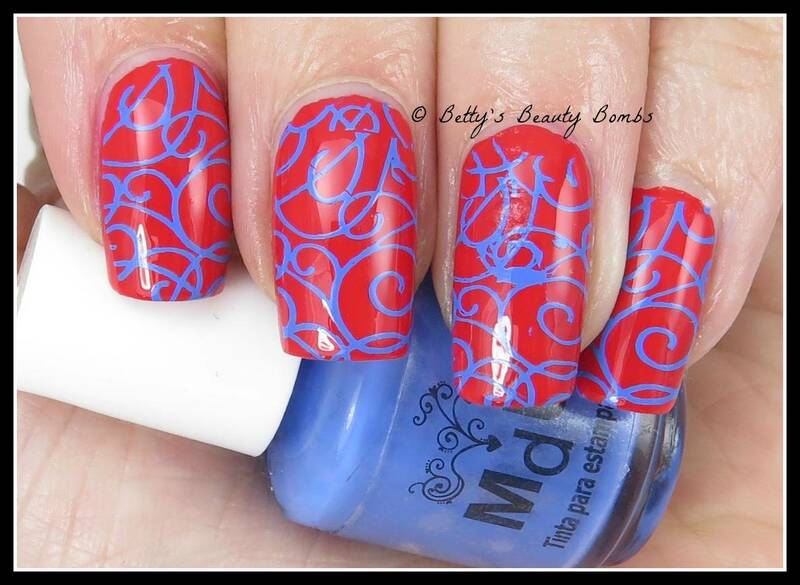 You can see all their available image plates here: BornPrettyStore Stamping Image Plates. 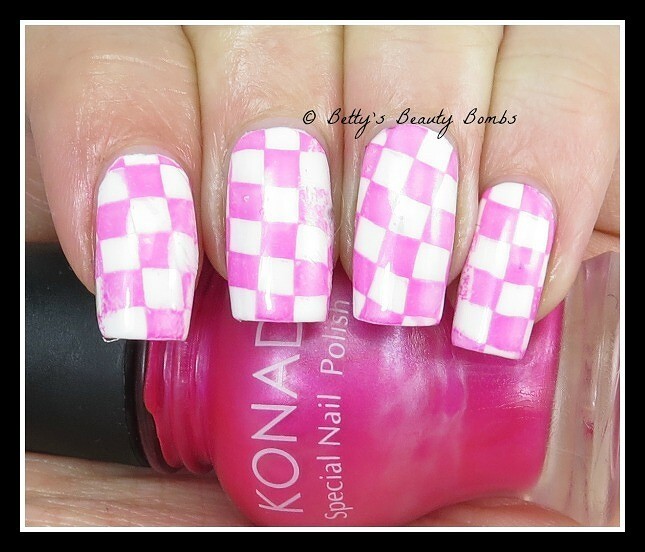 I wanted to see how the checkerboard pattern would work. I actually like it, but my topcoat messed it up a little bit. It didn’t smear the design so much as it picked up little particles of pink and dragged it over the white so the white doesn’t look crisp and clean. I used OPI Alpine Snow and Konad Princess Pink. Today’s nail art has a bit of a Hawaiian feel to it! I started with two coats of Zoya Leslie which was sent to me as a press sample for this post here. Then, I used Mundo de Unas Iris and a design from Born Pretty Store Plate BP-L-005 which was also sent to me as a sample. You can see all their available image plates here: BornPrettyStore Stamping Image Plates. I didn’t mean for it to look tropical, but that’s how it turned out and I really enjoyed wearing it! I’ve only been to Hawaii once (in 5th grade….a long, long time ago) but I do have fond memories of it! I haven’t been back because now that I’m a grownup with a house, husband, and dogs it’s much harder to get away! I can’t even imagine how people with kids manage to take any vacation! I guess the main difference is that you have the option of taking your kids with you…while my dogs? Not so much. 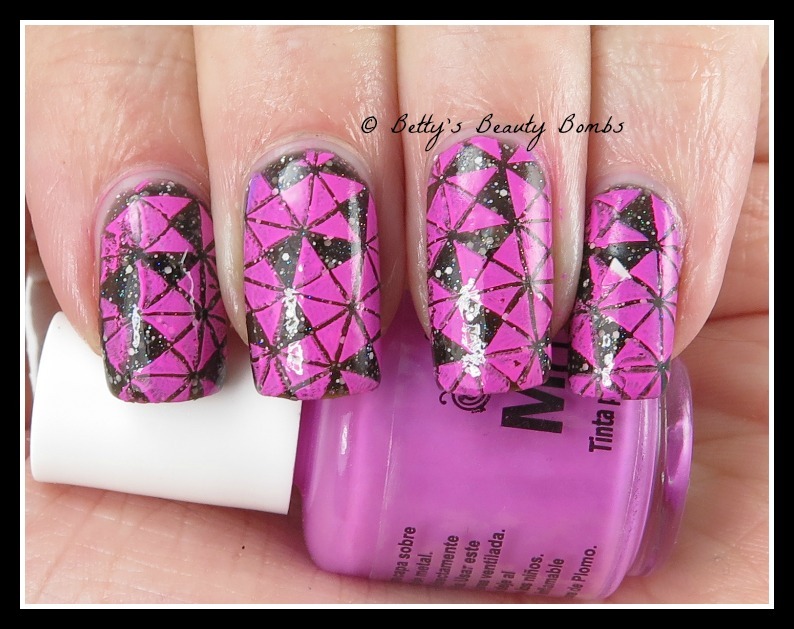 Today’s nail art is for this week’s “geometric” prompt from the Crumpet’s 52 week pick and mix challenge. I started with three thin coats of Mango Bunny Polish Ninja Bunny. 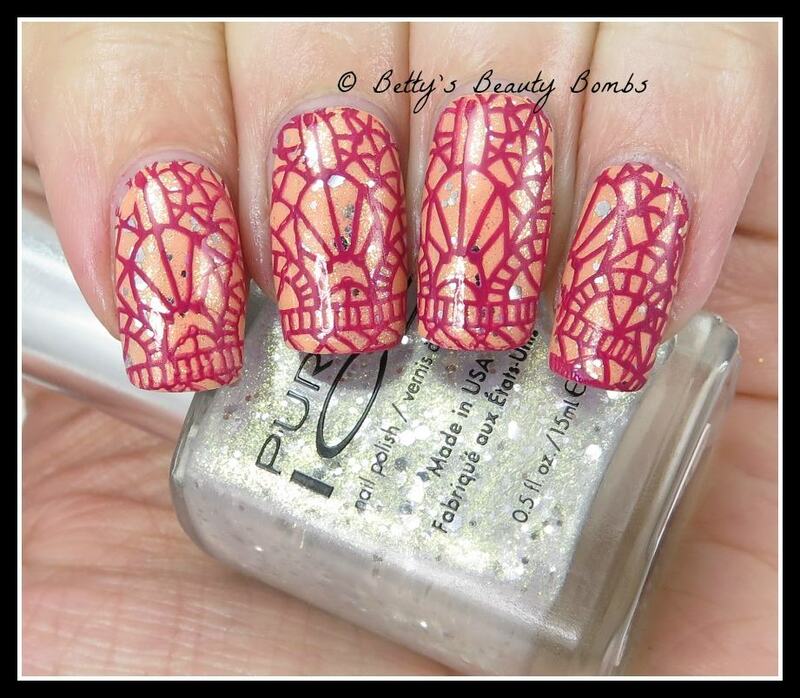 The stamping polish is Mundo de Unas Mexican Pink and the design is from Vivid Lacquer Plate VL034. The pink covered up more of the Ninja Bunny than I would have liked but at least I adore pink! Here is a plain swatch of Ninja Bunny. It’s a black jelly with small white glitters and white triangles. You can see the white triangle best stuck to the lid. LOL! I guess I can be a little messy! I think I’m going to leave it there. Just for fun. 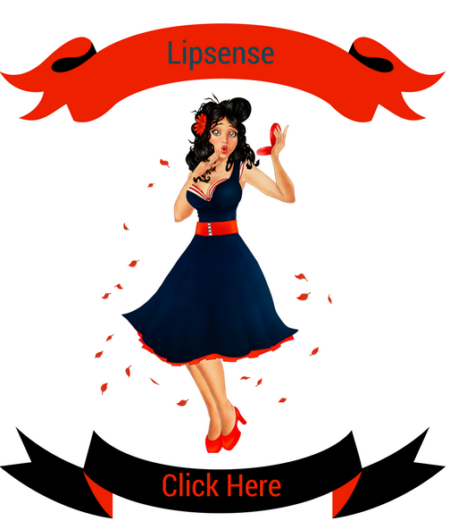 Anamarie from Bliss Kiss sent me her newest product offering! She has been working on a liquid latex barrier to help with nail art, cuticle removal, and as a peelable base coat! Liquid latex has become all the rage in the nail art community because it makes clean up easy and breezy! Please note that if you’re allergic to latex, you should not use this product as it really does contain latex. 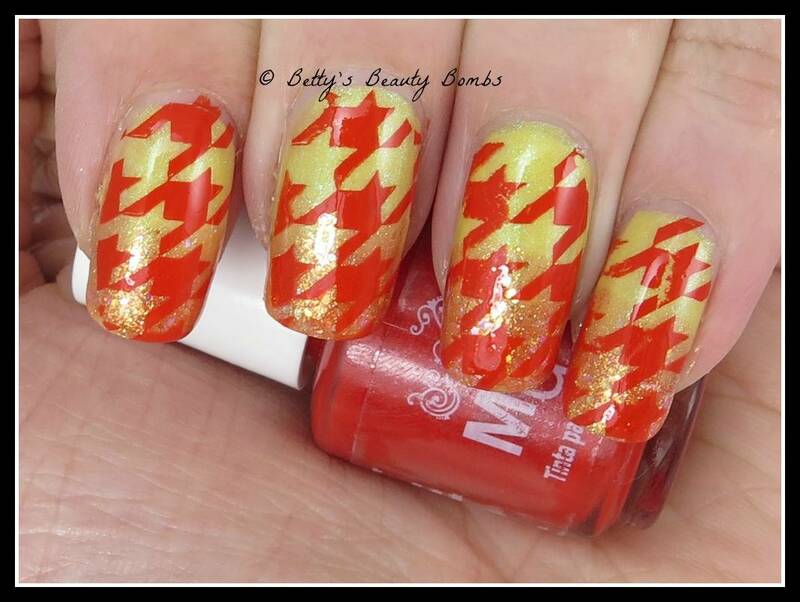 I did this chevron nail art using Simply Peel to help my cleanup! I picked this silver because anything that is shimmery or glittery is really hard to clean up. Shimmer gets everywhere! So this silver polish (OPI This Gown Needs a Crown) would be a good test of this new liquid latex barrier. I thought that I could do some Friday the 13th nail art for you today, but March also has a Friday the 13th so I’ll save it for then! 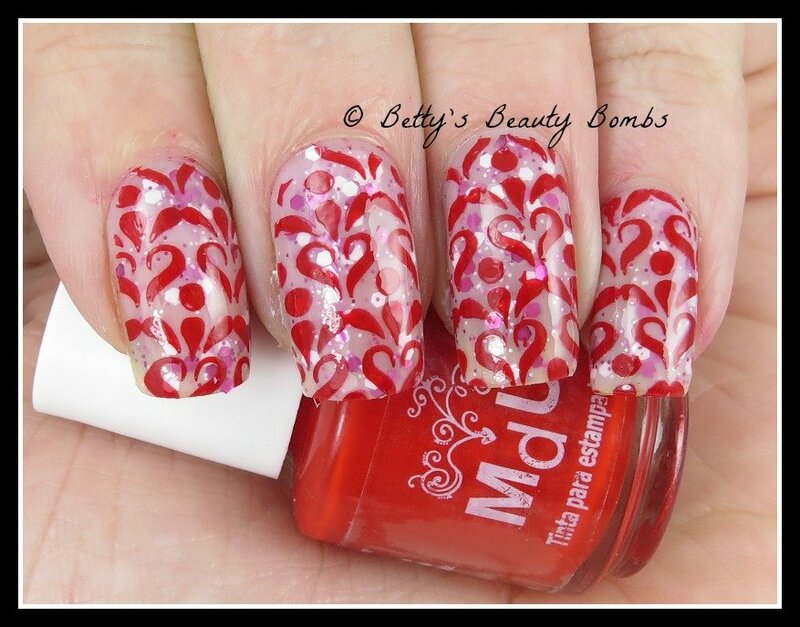 Instead, today, you get some Valentine’s Day Nail Art! I started with two coats of OPI The Power of Pink which is a light pink milky polish with pink and gold hex glitters. Then, I used Mundo de Unas Red and a design from Pueen Plate 84. 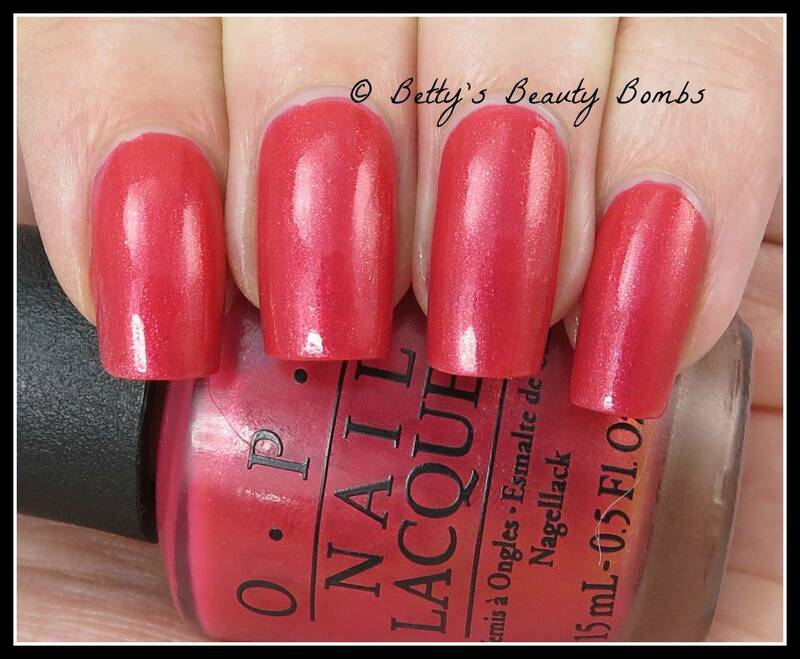 For your viewing pleasure, here is a swatch of OPI The Power of Pink. 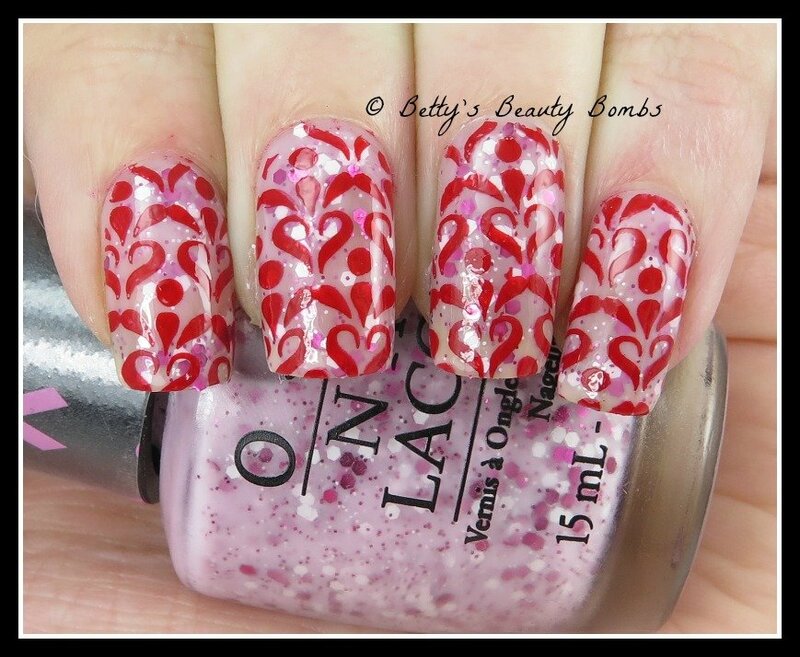 Author AnnePosted on February 13, 2015 December 22, 2016 Categories Art, Stamping, SwatchTags Art, Mundo De Unas, OPI, Pueen, Stamping, SwatchLeave a comment on Valentine’s Day Nail Art!